I recently penned a blog post regarding the sorry state of grammar online and the response that I received was so considerable that I decided to write on this topic again. I have to admit, it was somewhat refreshing to receive so much feedback, if only for the fact of realizing that there are many grammarians out there dedicated to the cause of good grammar. And they are watching. So, in my last post I commented that it is somewhat appalling when we see professional people who so willingly and unapologetically destroy the English language when posting to blogs, Facebook, Twitter and the like. I based this tendency on two things, either a.) people don’t proofread, or b.) people don’t care. Your Chance at Public Service: Stop Hurting the Eyes of Former English Majors! So, to members of these groups I offer a list of the most prevalent grammar gaffes made online. I invite you to read and learn, and even if you only implement one correction in your social media posts, I will feel happy knowing that I was able to do a little something to clean up the Internet. Rules for beginning a sentence, and ending one: There is no way around this. You need to start a sentence with a capital letter and end it with some form of punctuation, be it a period, a question mark or an exclamation point. Furthermore, you can’t end a sentence with a colon or a semi-colon, so don’t try it. Punctuation, generally. I defer to that popular meme on Facebook for this one. 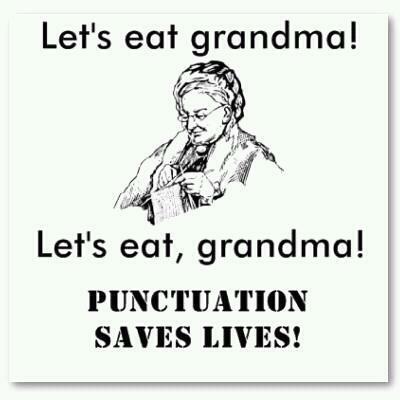 Namely, that punctuation saves lives. There are many more grammar gaffes that need to be covered. However, I feel that a Part 3 is required in this public service message, as I have given grammar abusers plenty to think about and implement with this post. So now go, use these new skills and impress your friends, co-workers and the nameless, faceless masses on Twitter. Because remember, no matter where you go or what you do, a grammarian is watching. To learn more about what you can do to improve grammar on the Internet, contact the team at Grammar Chic for any sort of writing or editing assistance. We are happy to lend you our eyes and provide the guidance you need to look awesome, no matter if you are writing a tweet, a blog post or a manuscript. Visit our website, call 803-831-7444 or email info@grammarchic.net. Don’t forget to follow us on Twitter @GrammarChicInc!